Mixing paint to achieve a “slate blue” should be fairly simple. As with most colors, the precise nature of “slate blue” is not exactly defined but it is generally considered to be a gray-blue. With this in mind, there are definite colors you can experiment with to achieve the particular shade of slate blue you desire. Begin with a base of Columbia blue paint in the mixing container of your choice. Add approximately 1/3 of the amount of paint that you believe you will need. It is a good idea to start with a smaller amount than necessary, as you will be experimenting with different color combinations. Add a small amount of gray paint. If this gets too muddy-looking, add some white paint to brighten the mixture. Be sure that you thoroughly mix the paint before adding another color. Adjust with more Columbia blue, as necessary. If you want a darker slate blue, add a small amount of navy blue paint. Black paint could also be added but navy keeps the blue tint much more nicely and is not as overwhelming to the mixture. Apply a small amount of paint to a sample surface and allow to dry. If the dried sample is not quite the shade you wanted, continue to experiment with different proportions of colors until the desired hue is reached. 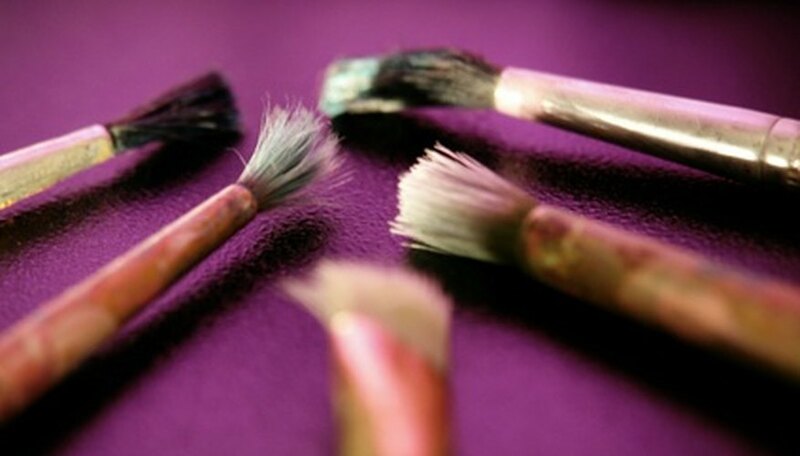 Paint often darkens after it has dried, so don't decide on a mixture until you see how a sample dries.